His Divine Grace A.C. Bhaktivedanta Swami Prabhupada founder Acharya, ISKCON appeared in this world in 1896 in Calcutta, India. His spiritual master, Srila Bhaktisiddhanta Sarasvati, a prominent religious scholar and the founder of sixty-four Gaudiya Matha’s (Vedic institutes), liked this educated young man and convinced him to dedicate his life to teaching Vedic knowledge. Srila Prabhupada became his student and, eleven years later, his formally initiated disciple. At their first meeting, Srila Bhaktisiddhanta Sarasvati Thakura requested Srila Prabhupada to broadcast Vedic knowledge through the English language. In the years that followed, Srila Prabhupada wrote a commentary on the Bhagavad-gita, assisted the Gaudiya Matha in its work, and in 1944 started Back to Godhead, an English fortnightly magazine, now being continued by his disciples in more than thirty languages. Recognizing Srila Prabhupada's learning and devotion, the Gaudiya Vaisnava Society honoured him in 1947 with the title "Bhaktivedanta." In 1950, at the age of fifty-four, Srila Prabhupada retired from married life, adopting the vanaprastha (retired) order to devote more time to his studies and writing. Srila Prabhupada travelled to the holy city of Vrndavana, where he lived in humble circumstances in the historic medieval temple of Sri Sri Radha-Damodara. There he engaged for several years in deep study and writing. He accepted the renounced order of life (sannyasa) in 1959. At Sri Sri Radha-Damodara Temple, Srila Prabhupada began work on his life's masterpiece: a multi-volume translation of and commentary on the eighteen-thousand-verse Srimad-Bhagavatam (Bhagavata Purana). He also wrote Easy Journey to Other Planets. After publishing three volumes of the Bhagavatam, Srila Prabhupada came to the United States, in 1965, to fulfil the mission of his spiritual master. Subsequently, he wrote more than sixty volumes of authoritative translations, commentaries and summary studies of the philosophical and religious classics of India. In 1965, at seventy years of age, he ventured outside India for the first time to fulfil the order of his spiritual master. During his voyage at sea, he suffered two severe heart attacks. He reached the shores of America on a cargo ship “Jaladuta” with the equivalent of only seven dollars to his name. Only after almost a year of great difficulty, he founded the International Society for Krsna Consciousness with a small group of disciples. This marked the only time in history that a Krsna devotee successfully trained non-Indians in the strict disciplines of Vaisnavism. Amazingly, this was achieved during the blossoming of America’s hedonistic counterculture movement. He formally initiated thousand’s of disciples. These initiates represented a sweeping diversity of nationalities, races, ethnicity, and religious backgrounds. He established 108 Krsna temples on six continents, installed the deity of Krsna in each centre and trained his disciples in the process of deity worship. Thirty-two new temples (almost three a month) were opened in a single year, between 1970 and 1971. He inaugurated the Ratha-yatra Festival of Lord Jagannatha in major cities around the globe, in effect, bringing the temple to the people. He instructed his disciples in 1967 to start an incense business to provide financial support for the temples. Within four years the business, Spiritual Sky Incense, generated annual revenue of one million dollars (equivalent to $4,600,000 in 2004). He had scores of interviews and philosophical discussions with news reporters, scientists, religious leaders and politicians, as well as meetings with world-renowned dignitaries and celebrities like Indira Gandhi (Prime Minister of Indiua), Lal Bahadur Shashtri (Prime Minister of India) Allen Ginsberg, Ravi Shankar, Alice Coltrane, John Lennon and George Harrison. He formed the Bhaktivedanta Swami Charity Trust to unearth and renovate the holy places of Lord Chaitanya’s pastimes. He counselled his disciples on complex managerial, philosophical and personal issues in more than 6,000 archived letters. He founded the Bhaktivedanta Book Trust (BBT) in 1972, to produce his books. By 1976, over 55,000,000 literatures had been published in twenty-five languages and distributed in almost every country, making the BBT the world’s largest publisher of Vedic religious and philosophical texts. One printing alone of Bhagavad-gita As It Is required seventy-six train cars to ship the paper needed to print it. He skilfully managed his international society simply through letters and personal meetings, virtually without the use of a telephone. The Srimad Bhagavata Mahatmyam (The Glories of Srimad Bhagavatam) is a section of the Padma Purana. It tells the story of how Bhakti can be revived in Kali-yuga through recital of Srimad-Bhagavatam. 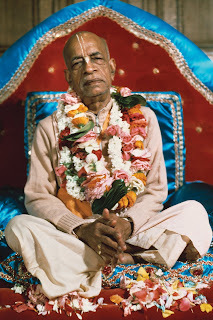 When Srila Prabhupada left Vrndavana and came to America, it is significant that his only possession was a trunk containing the first volumes of his Srimad-Bhagavatam, which he considered his most important work. It is also significant that he instituted daily recitation of the Bhagavatam as the foundation of the temple program, and that Srimad-Bhagavatam (in the form of Krsna Book) was the first of Srila Prabhupada’s books to be distributed in large quantities. Until Srila Prabhupada came to the West, devotional service (Bhakti) had never been successfully introduced in foreign lands. If some sinful people escape and giving up religious principles go to far off countries, then my Senapati Bhakta will come at that time to give them Krsna consciousness. "Very soon the unparalleled path of hari-nama sankirtana will be propagated all over the world… Oh, for that day when the fortunate English, French, Russian, German, and American people will take up banners, mrdangas, and karatalas and raise kirtana through their streets and towns! When will that day come?" This return back to homeland of Srila Prabhupada is particularly significant, because this time he comes back with a host of his Western disciples. This signifies to me the meeting of the East and the West, or at least the beginning of such a meeting. This signifies the victory of spiritualism over materialism, of good over evil. This is really a rare moment in history, for the first time in the history of the world, for the first time at least in living memory, Vaisnavism, the message of Vaisnavism, the message of Mahāprabhu, the message of devotion and of pure devotion has been carried to the West and carried so successfully. I am sure that historians of the future will have a lot to say about Prabhupada and his movement, and they will be even envious of us for living in a time when this movement was begun and for participating in it. Any one of the feats mentioned above would be a significant feather in anyone’s cap—even if it were the only thing a person accomplished in a lifetime. That Srila Prabhupada did all these things in just twelve years, and fulfilled so many predictions of sastra, great devotees, acaryas and astrologers, and the Supreme Personality of Godhead Himself, is patent validation of his inimitable role in Vaisnava history. By his efforts, uncountable millions have read about Krsna, honoured Krsna prasadam, and heard and chanted the maha-mantra. Through his teachings, he continues to relieve humanity from the maladies spawned by doctrines of monism and voidism, while holding open the door of Krsna-bhakti for many generations to come. Let us recognize and remember his unprecedented contributions and strive to bring him honour throughout the world. Devotee: Prabhupada, they said that if Caitanya Mahāprabhu wanted Krsna consciousness in the Western countries, why didn't He go there Himself? That's what they told us. A. C. Bhaktivedanta Swami Prabhupada ki jai!